With BlackBerry’s decision to eliminate Good for Enterprise from its product line, users of this platform face a challenge that must be addressed by August 17, 2017, the day the product reaches end of life. Whether users and IT managers are happy or not, a new solution must be selected. 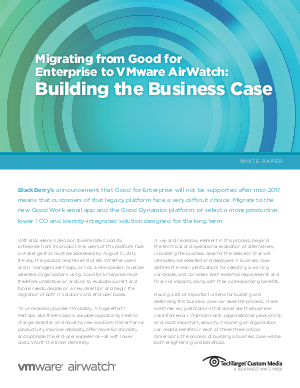 Organizations using Good for Enterprise must therefore undertake an analysis to evaluate current and future needs, decide on a new direction and begin the migration of both IT solutions and end-user bases.